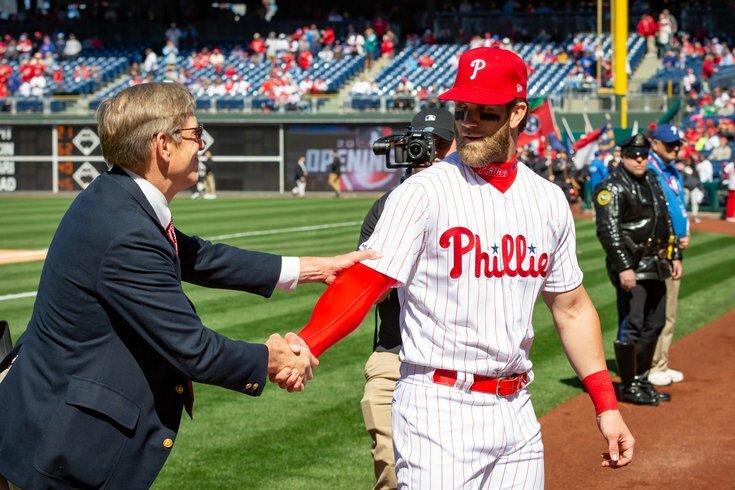 Bryce Harper shakes hands with Phillies owner John Middleton as he enters the dugout just before the start of the Phillies Home Opener, Thursday, March 28, 2019. The Phillies have looked good and been fun, they've won seven of their first 10 games of the season, and butts are officially back in seats at Citizens Bank Park. But the actual game is only part of what makes a franchise valuable. According to Forbes, the Phillies have a ways to go to becoming the most valuable franchise in baseball. Phillies' bullpen is an issue — but how big an issue is it really? With Keuchel's asking price reportedly down, will Phillies pounce? Hagen: How does Vince Velasquez fit into the 2019 Phillies? Forbes released its annual ranking of Major League Baseball franchises on Wednesday, and the Phillies came in at No. 9, the exact same place they found themselves in 2018. The franchise is currently valued at $1.85 billion according to Forbes, a nine percent increase from last year’s figure of $1.7 billion. It’s certainly not No. 1 — and, with the Yankees running away from the field at a mind-boggling $4.6 billion, it likely never will be — but showing up in the Top 10 and inching closer to a $2 billion valuation certainly isn’t bad. It's also worth noting that in 2019, for the first time ever, every MLB franchise was valued at or above $1 billion. Of course, everything is worth taking with a grain of salt. These figures are based on last season, when the Phillies were middling and far fewer fans were flocking to the park. After signing Bryce Harper to a $330 million mega-deal and improving the on-field product, the next 13 years could easily see rapid growth and acceleration past the franchises immediately above them, like the Los Angeles Angels ($1.9 billion) or the St. Louis Cardinals ($2.1 billion). The Phillies, it’s worth remembering, signed a $2.5 billion television contract with NBC Sports Philadelphia, then known as Comcast SportsNet, in 2014.